YF1AR yankee foxtrot one alpha romeo: Rhombic Ranch! Welcome to Joby's Rhombic Ranch! I became a Ham in 1978 while still in high school. As I studied the ARRL Antenna Handbook I learned about the various types of antennas. I couldn't get excited by dipoles, loops, yagies, or quads because I wanted one antenna that would cover many bands and produce a strong signal. The log periodic qualified on the first account but failed the "Really BIG Signal" requirement. Then I started reading the section on long wires. This caught my attention. One antenna can cover all the bands and if sufficiently large can also produce a big signal. 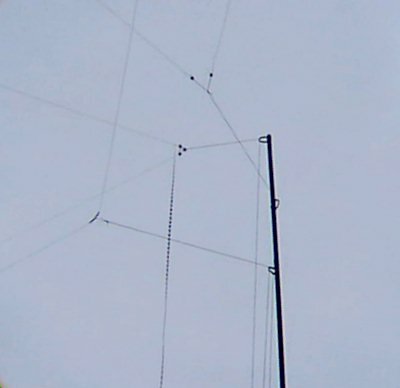 As I read on through the section I learned about single long wires, then V beams and finally Rhombics, I decided that my dream antenna system would consist of several rhombics pointing in different directions that I could switch between from the shack. At the time I had few resources and settled for a couple of dipoles. It was the high point of the sun spot cycle and I was working the world just fine. I started college at Texas A&M that fall, so my dream antenna stayed a dream. After college I got too busy making a living and went inactive for about 15 years. Fast forward to 1996. I have been back on the farm for 9 years working constantly between my in town job at the Electric Coop, clearing land, putting in fields and generally building the farm into a money making enterprise. That spring we had one of the most intense dry spells recorded. There was no hay to cut, no money for new projects, I was left with little to do. Out of boredom, I pulled out my old TS 520, tossed a wire into an oak tree and made a few contacts. I was hooked once again on ham radio. 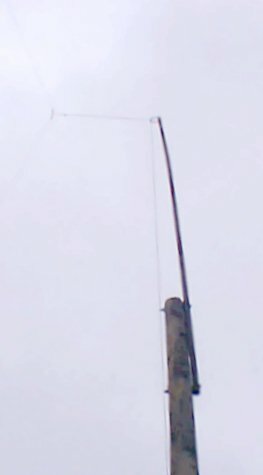 My Rhombic dream revived, I bought four 35 foot retired wooden poles from the Electric coop, 200 feet of 450 ohm ladder line and 840 feet of #14 copper weld wire. I staked the pole positions using 210 foot spans and a 64 degree tilt angle (52 degrees apex angle at the feed point). The long axis pointed generally to the South West. I assumed this would give me coverage of Australia and New Zealand to the South West and Europe to the North East. The minor lobes are about half the beam width and gain as the major lobe. So with this one antenna, I got two BIG signal directions and 4 good signal directions. Everywhere else signals were very weak. Amazed with the performance at 27 feet high, I decided to build several more and point them in other useful directions. After lots of playing with the great circle direction finder, I realized that just pointing antennas on the cardinal points of the compass would not align major lobes in the best directions. From my place Japan and South America line up quite nicely. Also central Australia and central Africa qualified as a must have pair of directions. I used a computer-mapping program at work to try to come up with ways to get more antennas for the least number of poles. Note that the secondary lobes tend to fill in the nulls between the major lobes. This is a great circle map of the world made by a program I got from http://hem.passagen.se/sm3gsj/gcm.htm you just give it your latitude and longitude and it will draw a map centered on your QTH. 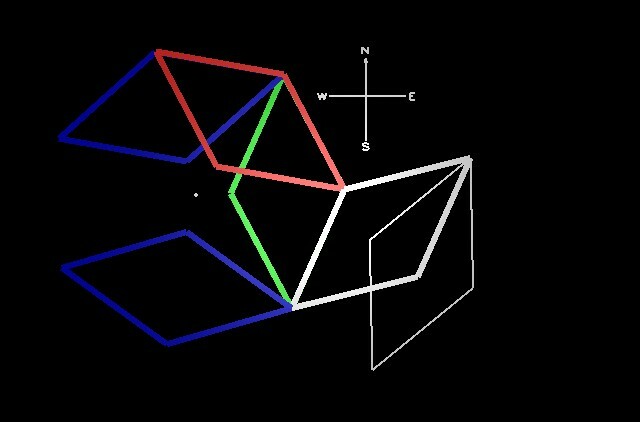 The shaded wedges represent the boundaries of each antenna’s major lobes. This system is simple to build. Each support consists of a used 35 foot class 5 wooden pole with a 30 foot section of 2 inch steel pipe overlapping the top of the pole 4 feet. They are bolted together with two 5/8 inch through bolts. Welded to the top of the pipe is an eyebolt that has a loop of dacron rope that runs the length of the pole and pipe. Once the poles were assembled and the hole positions staked out, I got a utility contractor to come out with his digger truck to dig the holes and set the poles. With the supporting insulators tied to their poles at ground level, I stretch the wire out hand tight and tie it to the insulators. Next I solder the 450-ohm ladder line to the feed point wires. Finally I untie the loop of dacron rope that is running up and down each pole through the eye bolts at the top. Tie one end of the rope to the support insulators and use the other end to hoist the antenna into the air the same way a flag is hoisted up its pole. It takes some walking back and forth between each pole to get the proper tension on each support. 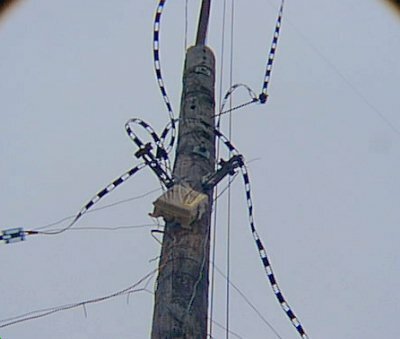 At each pole that has a feed point, the ladder line comes down from the feed point to near the top of the pole where it is taped to an insulator mounted on a steel rod that was driven into the pole. This keeps the feed line from flopping to much in the wind and keeps it from touching the pipe or pole. At this point the ladder line is connected to a DPDT relay. When the relay is energized then that rhombic is connected to the radio. If de-energized, power is sent to the next feed point relay. 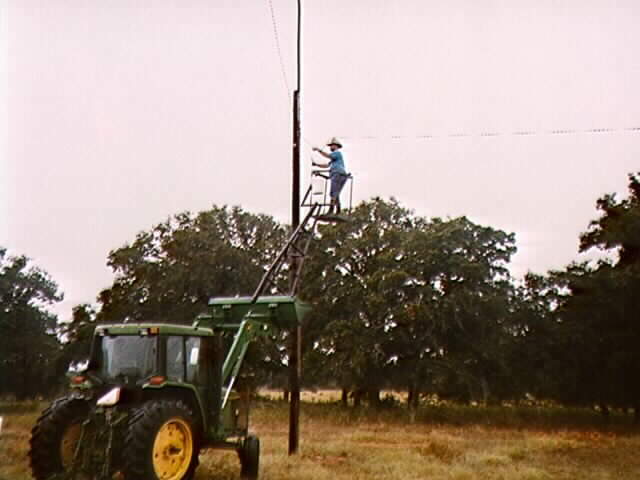 This is one of the poles with a relay box. Note that the control cable is tie wrapped to a support wire made of #14 galvanized electric fence wire. Lightning and static electricity buildup is an important consideration with long wire antennas. To protect the relays from arcing across the open contacts, I installed a Spark Plug lightning arrestor between each antenna and its control relay. I used #6 copper wire to connect the arrestor to a 5/8 inch wide 8 foot long copper clad ground rod driven at the bottom of each pole with a relay box. There is also one more lightning arrestor mounted on a ground rod that is bonded to the utility system ground before the ladderline enters the house. This bleeds off static from rain, snow, dust, or nearby thunderstorms, greatly reducing the receiver noise associated with this type of static. Hopefully this will also provide some protection from a direct lightning strike. Impedance matching is a simple matter. Since the antennas are not resonant on any particular frequency, I just use a 4 to 1 current balun and a PI network antenna tuner. The uncorrected SWR ranges from 1:1 to more than 10:1 depending frequency, and length of feed line between the antenna and transmitter. Transmission losses are minimal, even at 10:1 because of the very low loss characteristics of ladder line. In most cases, the automatic tuner in my Yaesu 920 can match any antenna in about 3 seconds. If it can't, I use the external manual tuner. If you would like to see what my Family and I look like, click here. 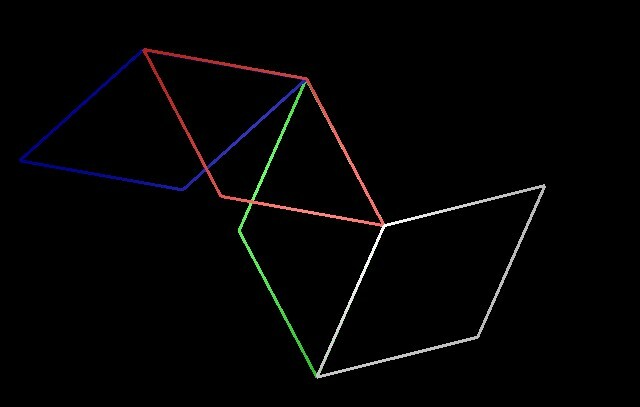 For an explanation of How Rhombic Antennas Work, click here.